Is there anything cuter than a pair of baby booties? Well, besides the baby. 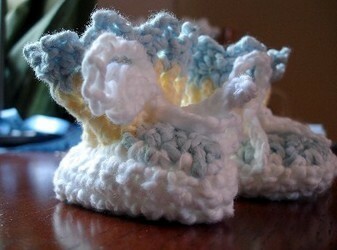 This pair is made especially for a newborn baby. -Finish off leaving a long tail for sewing up seam. -SC in between any two DCs on bottom of Color A section. -SC in between each DC until all the way round…17 SCs, sl st in first sc. weave chain in the color A section around to form tie. Pattern designed by Tamara Bower-Snow, who owns Roxycraft.com where you will find more free crochet patterns plus original exclusive patterns to purchase.